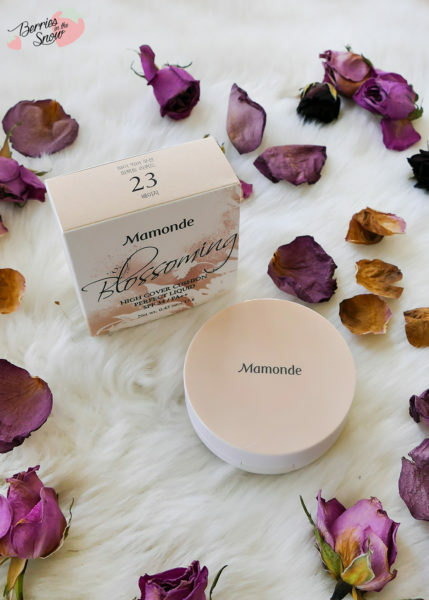 The funny thing about the brand Mamonde is that I have known it for ages, but I hardly ever reviewed their products…strangely enough! 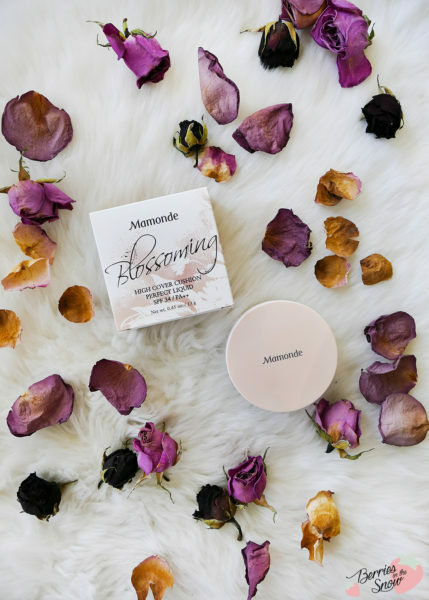 Mamonde is a brand by Amore Pacific and has been founded over 25 years ago. The brand’s motto is to believe in the power of flowers and use flower extracts in their cosmetic products. I’ve always been drawn to the rose skincare line of this brand because I love everything with roses! 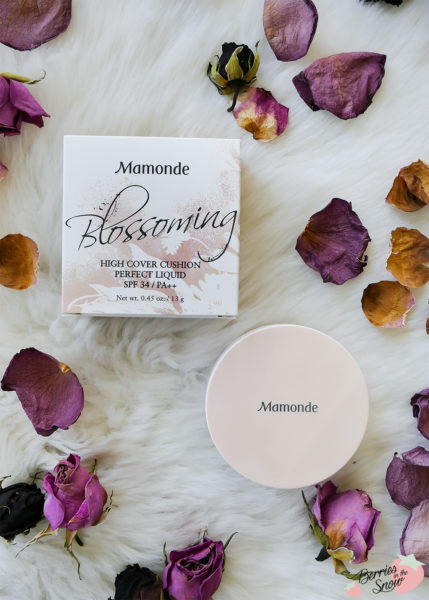 The Mamonde High Cover Cushion Perfect Liquid Cushion is my first cushion from the brand and it is a cushion foundation that comes in three different shades. I have selected the darkest shade, which is No.23, a beige, but still quite a light tone. Sorry, for all the tanned people out there at this point! The cushion is a high coverage cushion with a matte finish and SPF 34/PA++. 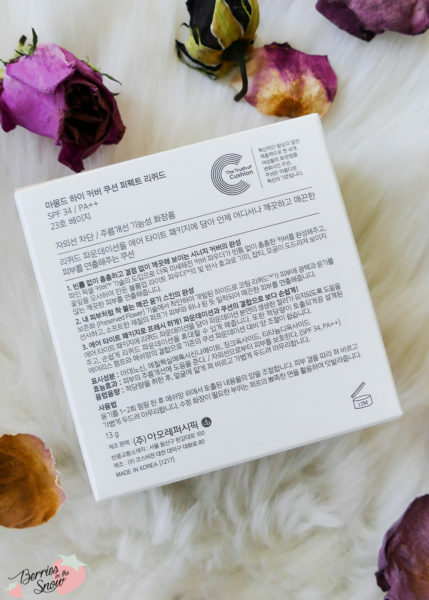 The cushion is perfectly suited for people with acne and skin irritations and for combination and oily skin types, but it also can be used on other skin types. 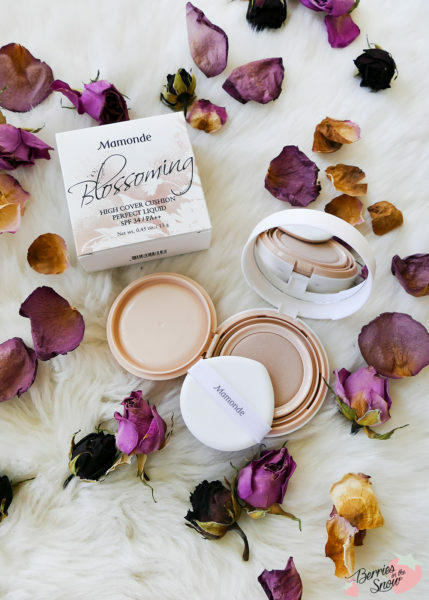 As all cushion foundations, the Mamonde High Cover Cushion Perfect Liquid comes in a compact pact with a mirror and an application puff. The liquid foundation is located inside an airtight packaging, unlike many “first generation” cushions, that had simply a soaked sponge as the cushion. Pressing the packaging releases the liquid foundation through the cushion. It is advised to apply the foundation first with a foundation brush ( or the so-called Mamonde Flower Petal Brush, which is sold separately) and use the included puff for touchups. 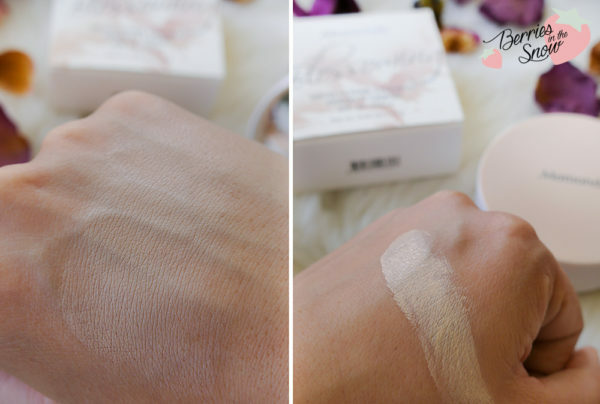 This foundation has finer cover powder thanks to Mamonde’s Fine Pixel Cover Technology, which results in a flawless finish. Additionally, it has a reflecting effect due to the Volume Up Light Powder. Round-shaped silica powder and silicon gel fill the pores and gaps and make the skin look even and smooth. The puff also sticks very closely to the skin and helps to create this smooth effect. 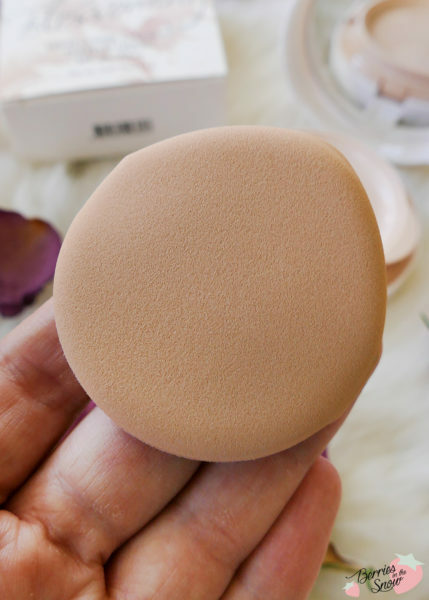 I was very skeptical at first because usually high coverage cushion foundations with a matte effect tend to make dry skin types look even drier and flaky throughout the day. I loved the airtight cushion at first glance though and that fact that it wasn’t simply a soaked sponge, but the product was only released when needed. Then I was a bit shocked that the darkest shade I selected (23) was still a bit too light even for my skin tone. Usually, shade 23 fits my skin just right. I was almost hopeless and didn’t want to wear it, but after some consideration, I gave it a try anyway. Yes, it is still a bit too light for my summer skin, but I hope that it will adjust within the next months. 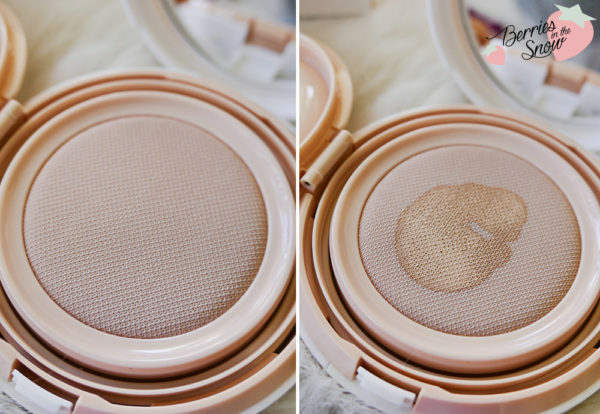 But my fears regarding dryness have not been confirmed and I must say that this cushion has a great coverage and lasting power! Even though it was raining and windy throughout the day the skin looked smooth and good when I returned home. That was the biggest surprise of all! The Mamonde High Cover Cushion Perfect Liquid has fulfilled all its claims and surprised me with a great coverage and long-lasting effect without making my skin flaky and dry. The airtight liquid cushion container is a great way to keep the foundation as fresh as possible, too! I would even love this more when it’s available in more shades for people with tanned skin and darker skin tones! 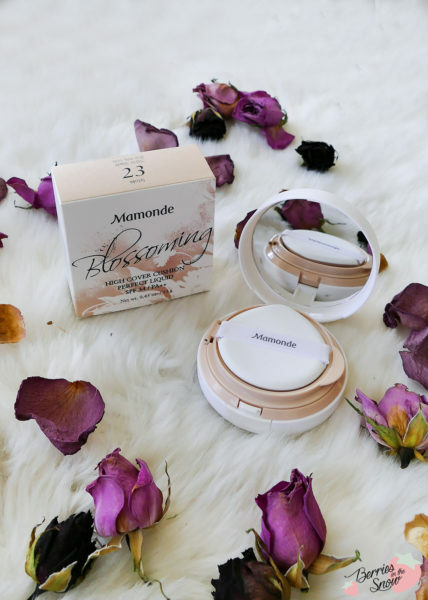 The Mamonde High Cover Cushion Perfect Liquid retails for 21250Won at TesterKorea, which makes around 22 US$. What is your favorite cushion foundation at the moment? Ich habe bislang nur ein einziges Cushion ausprobiert, und das war von Dior. Das normalerweise dewy Finish schreckt mich ab, ich brauche etwas mattierendes für meine ölige Haut. Das hier hört sich allerdings sehr interessant an. The limited shades are really my main downside for this cushion. Other than that I think it will be lovely for people with oily or combination skin types.